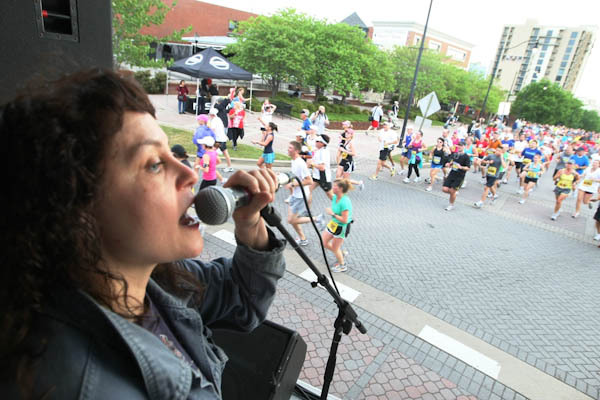 Country Music Marathon – A race against the tornado and more! 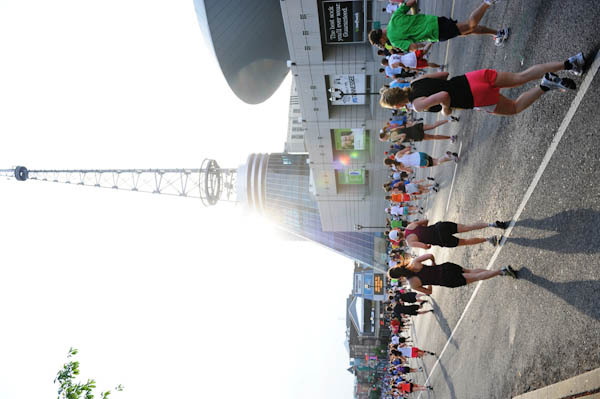 It was race between several marathoners and the tornado that was to hit Nashville on the day of Country music marathon (24th Apr 2010). Weather prediction's wasn't looking any good on Friday evening. 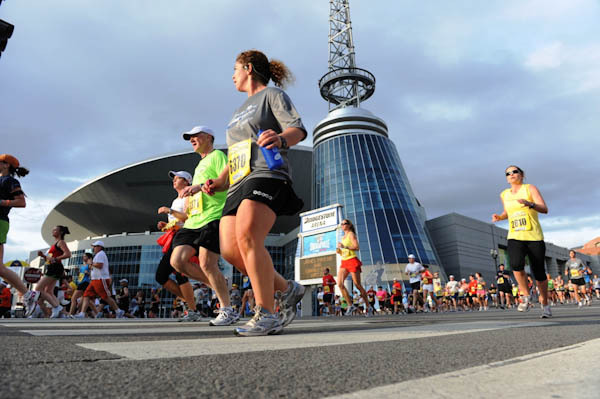 That's when the race officials decided to put in a clause stating only those runners who runs a pace of 10:20min/mile at mile 11.2 will be allowed to run the full marathon and anyone falling short of it would be diverted to complete the half marathon. This announcement came on Fri evening and 10:20 didn't sound too bad as I have run a 9:00min/mile marathon in the past. We were assuming that they would have some kind of a electronic mat to find out the runners pace and would allow them to continue running the full marathon based on their pace. 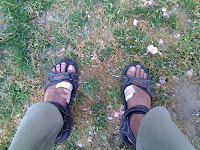 Having run the Andrew Jackson Marathon last week I was glad that my blisters healed completely (I got the blisters because of my own stupidity though) and thought I was ready for the race. Finally crossed the start line at 7:30am. That's right, 45 minutes after the start of the race. Nashville being known for its country music, there were bands all over the course. The race was very unique. Very special one. There were people everywhere. You could hardly run at full pace in that huge crowd. Maintained a consistent pace of 10:00min/mile. Tornado was to hit at around 10:00am. It was already getting dark and cloudy. Still on pace. Was enjoying the moment and the crows was just amazing. Stopped at a water station and danced to a few beats of Alan Jackson songs and started running again :). I was so much fun. Remember the Rule 1, "Running should be fun". A girl ran towards me like a fresh breeze and asked me what time it is. I told her the time and I started running. After exchanging a few glances she asked whether she could run with me as she found my pace very comfortable. Only a fool would say No and I ain't a fool. Not this time. :). The next 4 miles went by like it was a 1K jog in the beach. Slight drizzle, cool breeze and a pretty gril running with me, what can I ask for. She was a doctor from middle east working in Philadelphia. Tall, slim and very pretty. It was her first marathon. When she asked my running experiences I listed out my races and instantly became her hero :) . It was so much fun but still I was constantly keeping a watch on my pace. I was still at a good 9:55 min/pace. I was so hoping to make the cut off so that I could run the next 15miles with her, rather she can run with me. Picked up the pace and reached the mile 11.2 where we had a surprise waiting. A volunteer said that we can continue with the full marathon. Booom. I was telling him that I am on pace but he said that pace doesn't matter but they decided to close the full marathon course at a certain time. 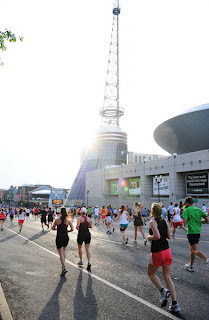 So whoever started in the early corrals made it but not us and the rest of the poor runners behind us who started late. Tornado defeated us. 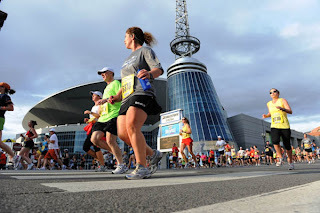 The girl was shattered as it was her first marathon and she traveled all the way for this race. We couldn't nothing as safety was the issue. I consoled her to my best and we continued with our race. I was depressed that I couldn't run the full marathon but more sad that I have very little time, you know why :( !! The next two miles was more fun. Anyway I couldn't run the full marathon, so let me take it easy and have fun running the half marathon, I decided. I slowed down a bit, she would run a bit fast and the moment she knows that I am not around, she would look around and would slow down a bit for me. I was looking at the heaven and thanking my dear God. It was one 'Alaipayuthey' moment. She was doctor, I am software engineer, awesome. My God didn't like me having fun for long. With just about a mile left to finish the race, she said that she injured her ankle a couple of months before while skiing at West Virginia with her husband. It felt like a thunder strike on me. Wait a second, did I hear it right, may be not, may be yes. 'Is your husband into running' I asked curiously keeping my fingers crossed, hoping she would say that she isn't married but I was wrong. She said that her husband doesn't run much, but likes biking and skiing. Nayagan background score was running in the back ground by now. 200 yards to the finish line. I was a gentlemen and let her cross the finish line seconds ahead of me. She was very excited about crossing the finish line and thanked me for making her run easy. "Likewise", I replied and exchanged warm hugs wishing good luck for the forth coming races. Didn't feel like hanging around after that and I told her that I need to go and wait for my friends at the finish line. She wasn't expecting that but she couldn't say much but to say "Bye". There ended my race. First not being able to run the full marathon and above that, another blow. My friends soon crossed the finish line and the heaven gates opened at the very same time. They race officials appreciated our commitment to run the full marathon and awarded us the Full marathon finisher medal but we weren't satisfied. We decided to walk from the finish line to the start line in that pouring rain, about 3-4 miles towards our hotel. The storm was in full swing but we reached hotel by then. Hot shower, hot cappuccino and a great time laughing over my funny short lived love story. A guy liked a girl but girl was married and the guy lived happily every after :)!! Now I am all set for my 'Strolling Jim - 40 mile' ultra next weekend. Wonder what I have in surprise over there!! Will keep ya all posted! !